Featured Image: An image of the distribution of GRBs on the sky at a distance of 7 billion light years, centred on the newly discovered ring. 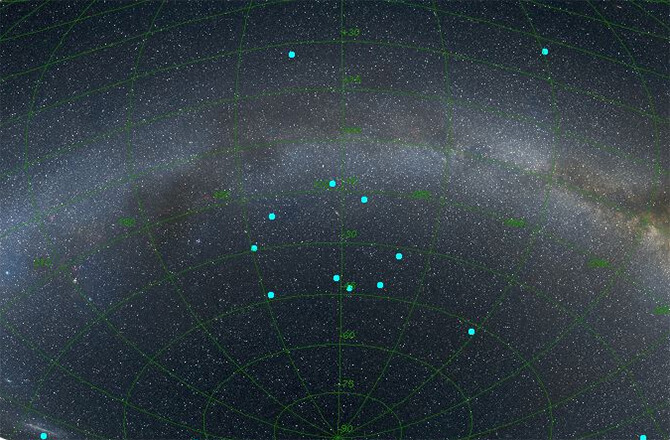 The positions of the GRBs are marked by blue dots and the Milky Way is indicated for reference, running from left to right across the image. Astronomers are constantly uncovering the “most distant,” “most massive” or “most energetic” objects in our universe, but today, researchers have announced the discovery of a truly monstrous structure consisting of a ring of galaxies around 5 billion light-years across. Astronomers believe these GRBs (and therefore the galaxies they inhabit) are somehow associated as all 9 are located at a similar distance from Earth. According to its discoverers, there’s a 1 in 20,000 probability of the GRBs being in this distribution by chance — in other words, they are very likely associated with the same structure, a structure that, according to cosmological models,should not exist. The GRB ring is 5 times larger than the 1.2 billion light-year limit; a pretty huge anomaly by anyone’s standard. And this latest discovery isn’t even the biggest. In 2013, another distribution of GRBs revealed a 10 billion light-year structure. Other large structures also defy this theoretical limit. “If we are right, this structure contradicts the current models of the universe. It was a huge surprise to find something this big — and we still don’t quite understand how it came to exist at all,” added Balazs. So is the Cosmological Principle flawed? It’s certainly looking that way. Are Humans Intelligent In The Grand Scheme Of The Universe?